As we discussed in Section 1.2, risk consists of two elements: uncertainty and exposure. A value-at-risk measure represents uncertainty with a characterization of the conditional distribution of 1R. It represents exposure with a portfolio mapping 1P = θ(1R), which may be a primary mapping or a remapping. To quantify market risk for a portfolio, we need to combine these two components. This is the purpose of a transformation procedure. A transformation procedure—or transformation—represents risk with a characterization of the conditional distribution of 1P. It then uses that characterization to determine a value for a value-at-risk metric. The value for that metric is the output of the value-at-risk measure. Linear and quadratic transformations apply to linear and quadratic portfolios, respectively. Monte Carlo transformations apply generally to all portfolios. In this chapter, we describe all three types of transformations. Linear transformations are most widely used. In practice, many portfolios are linear or so nearly linear that they can be accurately approximated with a linear remapping. Linear transformations are easy to implement, run in real time and are exact. The only reason to not implement a linear transformation is if a portfolio holds—or might some day hold—nonlinear instruments such as options or mortgage-backed securities. Quadratic transformations are used least. They are reasonably easy to implement, run in real time or near-real time and can be exact. Their main problem is the fact that actual portfolios are rarely quadratic. Nonlinear portfolios can be approximated with quadratic remappings, but the approximations are often poor. Still, there is an allure to quadratic transformations. They offer the potential to calculatevalue-at-risk for nonlinear portfolios in near-real time. Perhaps the most useful application of quadratic transformations is to facilitate variance reduction in Monte Carlo transformations. We discuss these important techniques in Section 10.5. Monte Carlo transformations are part of a larger category of transformations called numerical transformations. These encompass the use of any technique of numerical integration. Conceivably a transformation might employ quadrature. Along these lines, various “grid” or “lattice” transformations have been proposed. All suffer from the curse of dimensionality, which limits their applicability. By far, the most widely used numerical transformations are Monte Carlo transformations. These are appealing because they are applicable to all portfolios and do not suffer from the curse of dimensionality. Two drawbacks are the standard error introduced by all Monte Carlo analyses and the fact that run times can be long—often several hours. Exhibit 1.12: A reproduction of Exhibit 1.12, which is a general schematic for value-at-risk measures. Risk comprises uncertainty and exposure. An inference procedure represents risk with a characterization of the conditional distribution of 1R. 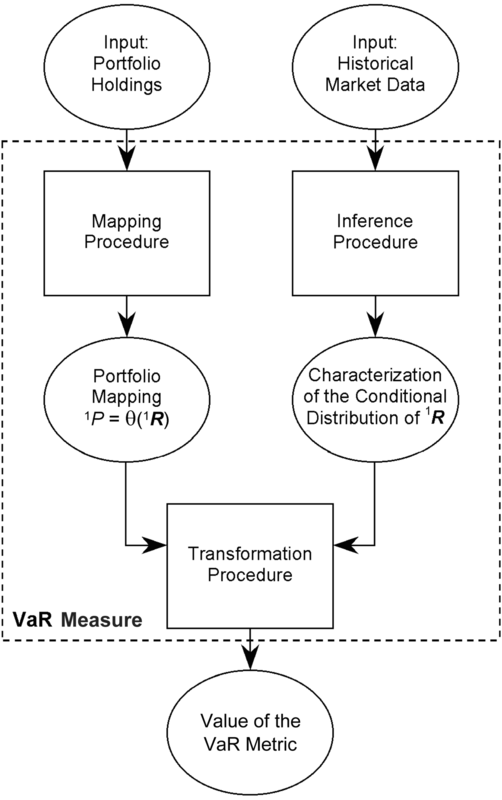 A mapping procedure represents exposure with a portfolio mapping 1P = θ(1R), which may be a primary mapping or a remapping. The topic of this chapter is transformation procedures. These combine the outputs of the inference and mapping procedures to characterize the conditional distribution of 1P.